West Caister is a small parish in the east of the county, close to Great Yarmouth. The hamlets of West Caister and West End are in the south, and the rest of the parish is dominated by scattered farms and drained marshland. Prehistoric flints (NHER 8684, 11655, 17360, 34033, 34034, 34035, 34037, 34038) have been found; several during a fieldwalking survey carried out by the NAU in 1997, which also revealed a prehistoric flint-working site (NHER 34037). A late prehistoric enclosure complex (NHER 27609) surrounded by linear ditches is visible as cropmarks on aerial photographs. A Neolithic flint axehead (NHER 12311) has also been found. A number of ring ditches (NHER 12187, 36766, 27377, 27380, 27381, 27395, 27547, 27548, 27572, 27573, 27596, 42086), probably the remains of Bronze Age barrows, survive as cropmarks located on a headland between two river valleys. An extensive cropmark complex (NHER 12828) around Nova Scotia Farm includes a Bronze Age field system and possible settlement, and Iron Age to Roman enclosures, trackways and a possible field system. An excavation carried out by the NAU in 1997 revealed a series of prehistoric pits and ditches on the site. The Bronze Age field system extends over a fairly large area (NHER 12996), and Bronze Age field boundaries (NHER 27512, 42086) have also been recorded, as well as a Bronze Age or Iron Age enclosure (NHER 27595). A Late Bronze Age hoard (NHER 12872) was found by a metal detectorist in 1977, and a Bronze Age axehead (NHER 17950) has also been recovered by metal detecting. Iron Age to Roman ditches, trackways, field boundaries (NHER 27382, 27393, 27399, 11656, 42086), and an enclosure (NHER 27549) have been recorded as cropmarks. No Iron Age finds have been recorded in the parish. A Roman farmstead and associated field system (NHER 27512) are visible as cropmarks on aerial photographs. An excavation carried out by the NAU in 1977 during the construction of the bypass revealed Roman ditches, probably part of an enclosure, as well as pits and Roman pottery (NHER 12737). Another excavation in 1986 revealed more Roman ditches and pits (NHER 12872), probably part of the civilian settlement or vicus, which surrounded the nearby Roman fort (NHER 8675). A Roman coin hoard was found on the site, as well as Roman pottery, brooches and other metal finds. Roman coins (NHER 8691, 11655, 11657, 14765, 14768, 17360, 20688, 23721, 37499), pottery (NHER 11655, 34039), roof tiles (NHER 13229) and other metal finds (NHER 14538, 17360) have been found by metal detecting and fieldwalking. Caister comes from the Old English meaning ‘Roman camp or town’. Although Caister is mentioned as a large and valuable holding in the Domesday Book, there is no distinction between the modern settlements of Caister-on-Sea and West Caister. The only Saxon finds recorded in the parish are fragments of Middle Saxon pottery (NHER 12872), and Late Saxon brooches (NHER 12872, 17360). Caister Castle (NHER 8671) is a medieval moated brick castle built in 1432 by Sir John Fastolf on the site of an earlier manor house. The castle is divided into two courtyards separated by a spur of the moat, and the ruins of the hall and domestic ranges are still standing, as well as a six-storey corner tower. The 15th century outbuildings of the castle, which were probably part of an outer court, are now incorporated into Caister Hall that was remodelled in the 1830s. The medieval parish church of St Edmunds (NHER 8694) is now in ruins, and only a small section of the 15th century nave walls and the tower are still standing. The church fell into ruins in the 17th century and was being used as a barn by the 18th century. The present church of St Edmunds dates from 1854. Medieval pottery, coins and metal finds have been found throughout the parish during fieldwalking and metal detecting surveys. The Cannons (NHER 28361) is a 17th century house remodelled in the 18th and 19th centuries. The 19th century well house in the grounds incorporates reused medieval stonework taken from the ruins of St Edmund’s Church (NHER 8694). The earthworks of possible post medieval water meadows (NHER 27376) are visible on aerial photographs to the south of West Caister. Caister White Mill (NHER 10543) is marked on Bryant’s map of 1826. The wind pump was replaced by a steam pump in the 1880s, and has since been replaced by an electric pump. Caister Black Mill (NHER 15630) is shown on Faden’s map of 1797. During World War Two a Wellington bomber crashed in the southwest of the parish (NHER 19690). 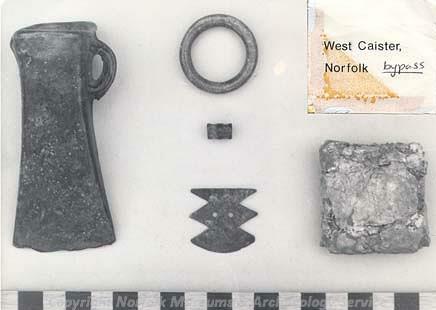 In 1984 an excavation by the Norfolk and Suffolk Aviation Museum recovered parts of the aircraft. World War Two anti aircraft batteries (NHER 29750, 27272) and pillboxes (NHER 32677, 32678) were constructed, as well as a coastal gun battery (NHER 27475), an air raid shelter (NHER 27482) and barbed wire defences (NHER 27519). Several World War Two bomb craters (NHER 27470, 27560, 27617) are visible on aerial photographs. A Royal Observer Corps post (NHER 35403) was constructed in the 1930s, and was replaced in 1953. An underground monitoring post was added to the site in the late 1950s. Sarah Spooner (NLA), 14 February 2006.